No part of this conspiracy is proven. Theory is intended to be taken at its literal definition and this post is something I wrote for fun in a purely speculative manner. This debate is fascinating to someone with an interest in wildlife biology so curiosity lead to investigation. I have no other outlet in which to publish this piece, so I hope you don’t mind my stepping away from the normal content of this blog for this one, albeit long, post. Recently an announcement detailed the extinction of a subspecies that may have never existed in the first place. There is major contention between Puma-related biologists as to whether the now extinct eastern cougar is (/was?) any different than the western cougar. In fact, the dispute continues on in saying the cougars found on the eastern side of the continent are surviving eastern cougars. Or are they western cougars who are wandering eastward into the forests that have recovered from utter destruction by settlers encroaching westward under manifest destiny? Or are they large cats escaped from captivity? Habitat now exists with the recovered forests and the prey base found in the problematic white tail deer population all over the eastern seaboard can certainly support predators. The debate rages and is actually quite fun to follow. Dismissal and denial of cougars by state wildlife agencies. While I was researching this topic for my own curiosity, I started to uncover a trend. People all over the Eastern US have reported cougar sightings practically non stop thorough human settlement in the region. Up until recently, they were mostly sighted by truck drivers or hunters and other outdoorsmen only to be written off by wildlife officials as comparable to Bigfoot sightings. However the advent of technology that put cameras in the pocket of most every citizen changed everything. Sightings were now being reported by everyday people; from stay-at-home parents to the same hunters as before. However, now the former is armed with a quick acting camera phones with the latter now using motion activated trail cameras to nonintrusively document wildlife. Yet state agencies are denying hard evidence that the cats are in their jurisdictions. Furthermore, some agencies admit to having cougars, but deny having a “breeding population” thus negating the need for a management plan. The last few decades have yielded accumulating confirmed evidence. Virginia 1990 – videos (though I have yet to find it online) and casted tracks confirmed cougar. 1997 mother and kitten reported with a kill of 25 goats. Kills not confirmed to be cougar. A reverse google search shows the picture was only ever shared on that hunting forum, thus is seemingly not the typical case of a photo circulated from a western state with a fictitious narrative. Michigan’s Department of Natural Resources (DNR) has a similar take on cougars. In the cougar FAQ section of their website, they acknowledge their presence but claim there is not a breeding population in the state. Rather, they state that cougars sightings are from animals escaped from captivity or from the Dakotas, listed as the nearest location of a breeding population. Other, independent wildlife groups reporting undoubtable evidence in both the upper and lower peninsulas compiled in this source (google books). This DNR report states that 26 confirmed sightings in the UP since 2008 but still denies that a breeding population exists. As such, no management plan is seen as necessary (archive source to avoid paywall). The Department of Game and Inland fisheries of my own state of Virginia states only “Unconfirmed sightings” have occurred in 29 counties. This is despite a Freedom of Information Act inquiry revealing that 5 of its own employees witnessed cougars in 1995. The man who lost 25 goats to a suspected cougar kill was awarded $4,5oo compensation approved by both the Virginia State Senate and House, only to be vetoed by the governor. Today, the cougar is not included in any tier of the VDGIF wildlife action plan. When I was young, coyotes were reported in the extreme western parts of the state but all of the wildlife agencies adamantly denied their movement into populous areas. Then boom! One gets killed by a commuter on Interstate 66 in a DC suburb of Virginia. It was mounted and put on display at a park I worked at as a teenager. They had thought the coyotes came from the great plains, but genetic testing showed that they came from New York. Even the experts can be wrong, but something more may be amiss. The actions of state wildlife agencies do raise some circumstantial questions. Why did WVDNR destroy its reports on the two lions confirmed in 1976? Why are most of the eastern state wildlife agencies refusing to entertain the notion that the animals may be breeding in light of increasing sightings and confirmations? Why did the governor of Virginia veto the compensation for the man who lost 25 goats? Why are agencies flat out refusing to work cougars into their management plans and consistently writing off sightings as domestic cats, bears, and golden or labrador retrievers? 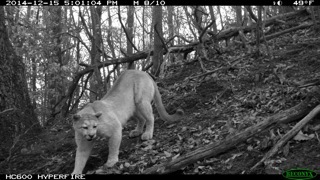 Articles like this one paint a strong case against the cougar in Virginia, but also omit the information obtained in the FOIA request. It certainly is not an issue of competence. These state agencies are comprised of avid outdoorsmen with years of specialized training and education. Speculation puts the answer in resource allocation. Budgets of state agencies are stretched thin enough as it is. If they were to acknowledge the existence of breeding populations of cougars, they would have to dedicate resources to creating management plans. After all, wildlife is property of the state until a permit is issued that transfers the animal to a private citizen. Thus, the state would be liable to compensate farmers for wildlife losses upon recognition that they manage a population of wild, breeding predators. Had the Virginia Governor approved the compensation for the farmer, it would have acknowledged that wildlife were causing damage to the agricultural economy setting the precedent that increased management of wild predators is required. Is the point of this to cause fear? Absolutely not! Over a period of 121 years, only 20 people have been killed by mountain lions. Only 3 people have been killed so far this millenia. Yet non-fatal attacks are up from 48 in the century ending in 1990, adding another 40 over the following 24 years. Heavily populated California sees the greatest proportion of encounters. With the unchecked whitetail deer population in the east coupled with the territorial cougars range of at least 25 miles, human-cougar interactions should be minimal. However, management plans by state wildlife agencies should be ready (or at least on the horizon) to ensure population numbers remain in check before a fatal encounter occurs in the east. Maybe management plans are not necessary and if cats are present, they may be peacefully living amongst us like the coyotes of past. On the other hand, it may take a fatal encounter in the east to officially put this animal on the map.